Placitas was resettled by the Spanish in !840, after years of conflict. Although there was no church at the time, the Catholic Church was providing services in the area, conducting masses in chapels at various locations throughout the Placitas area until the turn of the century. At that time the present church, San Antonio, was built and has served the people since (although Placitas has never had a resident priest). 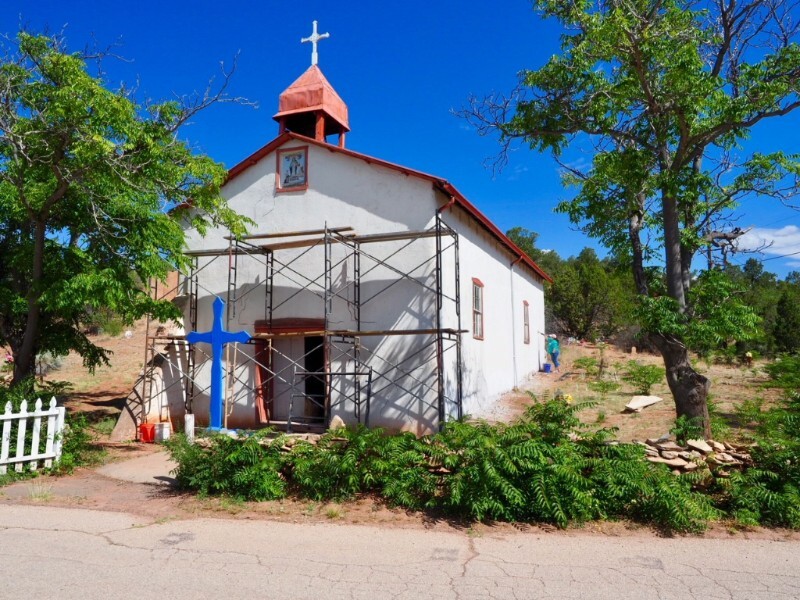 Twelve volunteers, including those from Cornerstones and community members, recently re-plastered San Antonio Church in Placitas, NM, working three six-hour days, starting July 12 and finishing July 14. Seven yards of soil and sand were used for this mud plaster, which will last for years. Volunteers and community members particularly enjoyed this experience, partly due to the architectural curvature of the area behind the altar. 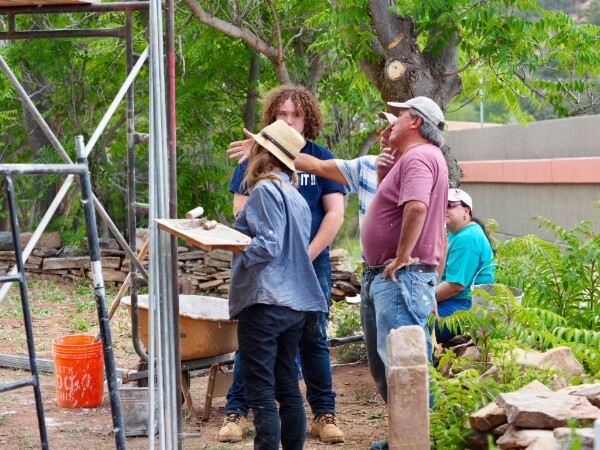 The group included a couple from Colorado, six Placitas community members and two volunteers from Ojo Caliente. Volunteers, Angela Francis and Jeff Davis, who have helped on the last three Cornerstones work projects, rounded out the group. Volunteers like these who produce professional results have added to the success of our summer program this year! Much fun was had and many bonds were made during this project. A big thanks to everyone who came out to help repair this historic structure. “Our Lady of Light" Church in Cañoncito, NM was built in 1880 and added to the National Register of Historic Places in 1995. The one-story adobe structure was constructed into a slope at the side of Apache Canyon and is a visibly attractive icon along Rt 25 north of Santa Fe. In June a TICRAT (International workshop for adobe preservation) took place at the church. This was a celebration of a previous workshop held in the 90’s at which time a major re-plastering of the church took place, organized by Cornerstones. Following the one-day TICRAT, community workshop, members, Cornerstones’ volunteers and project manager, Don Sena spent 3 days (July 5 -July 7) continuing the work started. Although afternoon thunderstorms forced some work stoppages, work included removal of old, eroded lime plaster around the base of the structure, repairing plaster failures and crack repair. New lime plaster was applied where needed. Several coats of lime wash were also applied to the exterior walls. Painting was initiated on windows and doors. One-half yard of sand and 4 bags of lime were used. The group included seven nearby community members and two Knights of Columbus members. 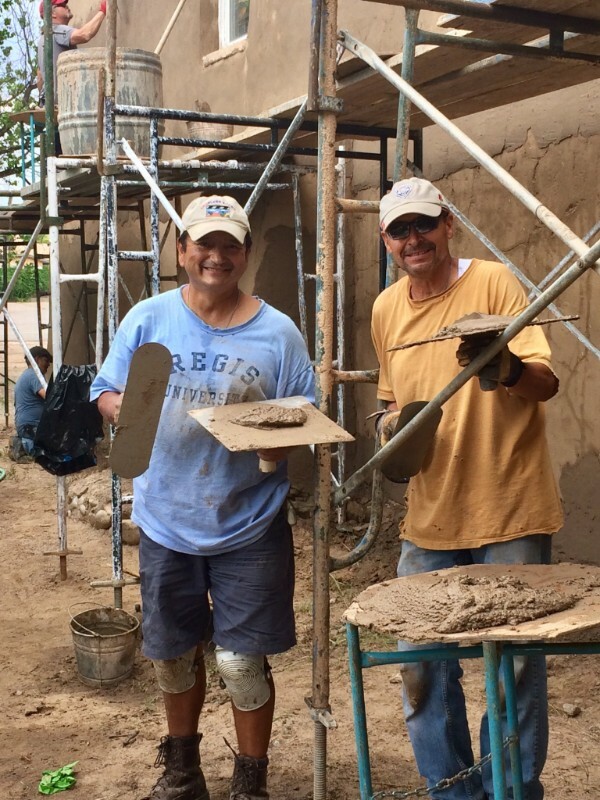 Adin Lichtenstein, Angela Francis, mentioned in the above article and a valued volunteer and highly skilled plasterer, and Bernadette Lucero (Archdiocese of Santa Fe) participated in the effort. Some work remains to be done to complete the preservation maintenance. 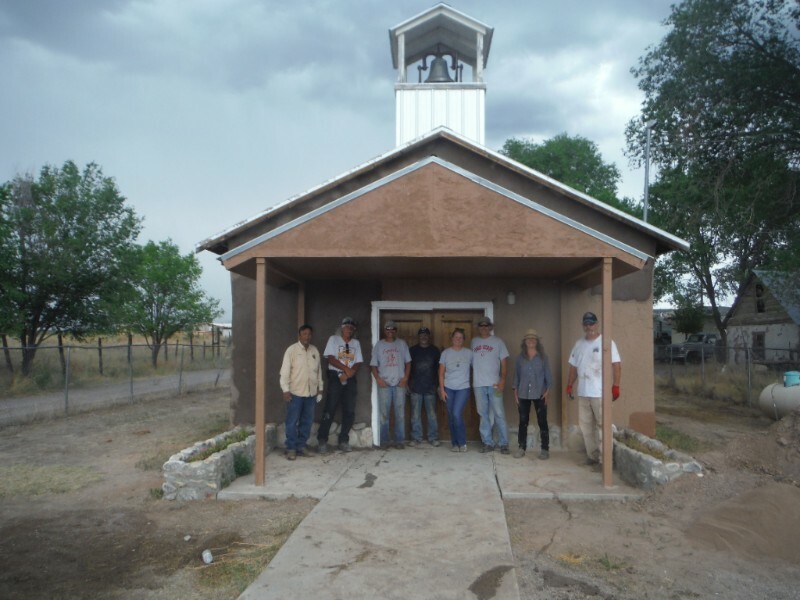 Cornerstones was gratified to return to the church after so many years to help make repairs. The church is challenged by not having a mayordomo or volunteers to maintain it for services. Elderly community members are hopeful for a renewal of these important functions. St Mary’s Church in Ojo Caliente, NM was built in the 1950’s, adjacent to the Santa Cruz church, which had fallen into disrepair. Santa Cruz was dedicated in 1812 but by 1885 was victimized by weather and pigeons. Newspaper reports of the day claimed thieves had stolen many of the religious artifacts. Over time, St. Mary’s church has required repairs itself. Cornerstones' volunteers have been active in mud plaster and basal repairs on the edifice since 2006. From July 25 through July 28 this summer, volunteers re-plastered the west-facing walls of St. Mary’s, working four six-hour days. Approximately 1 yard of sand and 5 yards of soil were used to re-plaster 3 west facing panels. Seven community members, Jeff Davis, Angela Francis, and Cornerstones Development Associate, Karen Kuranz, worked to get this project completed. A special thanks to other community members for assisting in making delicious lunches for the workers. Many thanks to all who participated!